We’re always looking for new trails; for walking, hiking, running, biking, and taking the dogs for walks on. I’ll also mention here that I also have a trails page – the Northern New York Trails Page that I try to keep updated at least some of the time. So while looking for trails we happened across a website for a trail at the Camillus Erie Canal Park. It looked good and also has a canal museum and boat tours (during the summer). The trail, interestingly enough, takes the route of the old towpath which was used by horses (and their handlers) to pull the canal boats along the canal system. In older blog entries I mentioned some of the Rails-to-Trails trail systems that are in this area. Some are extremely nicely done and some are more ATV paths and while we enjoy them all the rails-to-trails ones sometime get a little boring. They’re very straight and tend to not be visually very stimulating. But I’ m not complaining because it’s great that we can convert the infrastructure of formerly-cleared and built-up railroad beds into nice trail systems for the public. On the other hand the conversion of the former towpaths for the old Erie Canal system might offer some more interesting scenery. I won’t go into the history of the Erie Canal system – you can use the website at left for a beginning point and of course the Wikipedia entry. And as always; Google should be anyone’s best friend, both for official websites and research as well as tidbits that you can’t find otherwise. Suffice to say the canal was a major transporter of commerce through parts of the new York State during the 1800’s to early 1900’s and contained many locks, aqueducts, and many miles of canal system. Now some of that canal system has been restored and the towpaths converted into nice trails, though some of the canal system has been added to the New York State Canal System. The Camillus Erie Canal Park, established in 1972, is a nice little park, free, with a nice museum (also free from what I could tell), a large steam engine exhibit, and a paid boat tour of the canal through that section of canal. From the park eastward is a nice fine-gravel trail (a little over two miles one-way, four miles up and back) that ends at Warners Road/Route 173. This trail has many benches, shelters, a nature trail (where I believe you can see remains of an earlier canal), and a fully restored aqueduct (I kick myself for not getting pictures of it to show here). From the park a slightly shorter trail can be accessed on the opposite shore of the canal, this one dead-ends at the aqueduct but there is another trail further over (which we didn’t have time to find the entrance to). Going west from the park (this trail was under construction and off-limits to pedestrians so it is going to be a trip for another; warmer perhaps, day) is another trail along the canal that goes to Jordan, this trail is about 10.8 miles long. The Jordan end has a nice park, remains of an aqueduct, and a garden and park. Website with a bit about it here. I know – it looks a bit cold and uninviting in these photos. But it was a nice walk and nice to get out even though it was cold. And we’re looking forward to going back when it’s nice. Summer and we have returned to the trail system, this time traveling toward Jordan now that the road/trail has been fixed. And what a change, a nice day and we can actually enjoy the trip without bundling up and freezing. Our total was about twelve miles – we didn’t quite reach Jordan. Along the way we had the trail mostly to ourselves in the middle but near each end there were joggers, bicyclists, and walkers and a few fisherman. The trail is nicely maintained except for a few places where bushes have collapsed, and there was only one place with a bit of a wet part but nothing that couldn’t be walked, ran, or biked over without issue. Occasionally there are benches and parks, villages that are passed through, deer and turtles and fish in the canal. Very nice trail. From beside the museum looking east down the trail/towpath along the canal. Taken from in front of the museum, looking over the canal at the tour boat dock and storage buildings for the tour boats. Bridge over a canal feeder, leads to the trail on the other side. Looking west, the museum on the right. On the other side of the road is the westbound trail to Jordan. 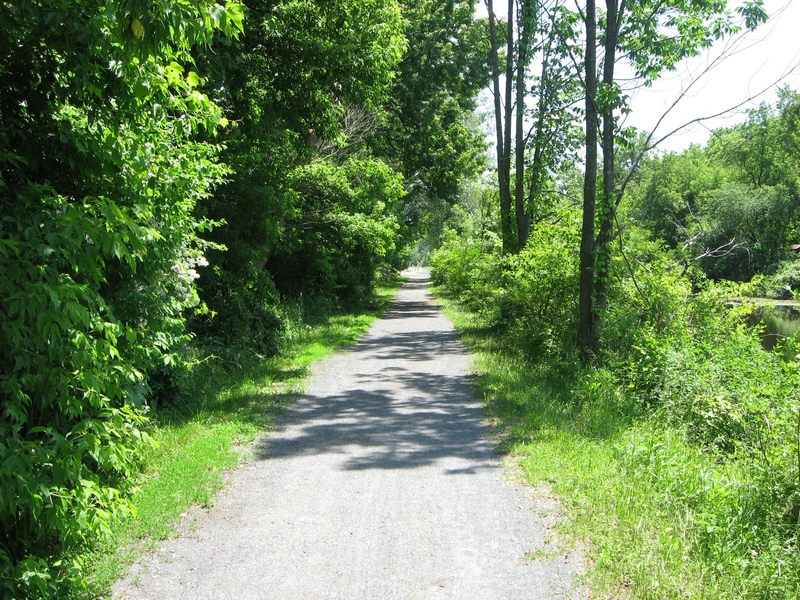 bicycle, bicycling, Bike, Camillus Erie Canal, cycle, Hike, Park, Trail, walk. Bookmark.